(L-R) Ms. Cynthia Llanes, Vice President for Academic Affairs, Technological Institute of the Philippines; Mr. Angelo Q. Lahoz, Senior Vice President, Technological Institute of the Philippines; Ms. Ma. Corazon Halili-Dichosa, Executive Director, Board of Investments; Mr. Masashi Takano, Team Leader, DTI-BOI-JICA Project; Mr. Philip A. Gioca, Country Manager, JobStreet.com Philippines, Inc and Monica Palomares, Marketing Specialist, JobStreet.com. Philippines, Inc. 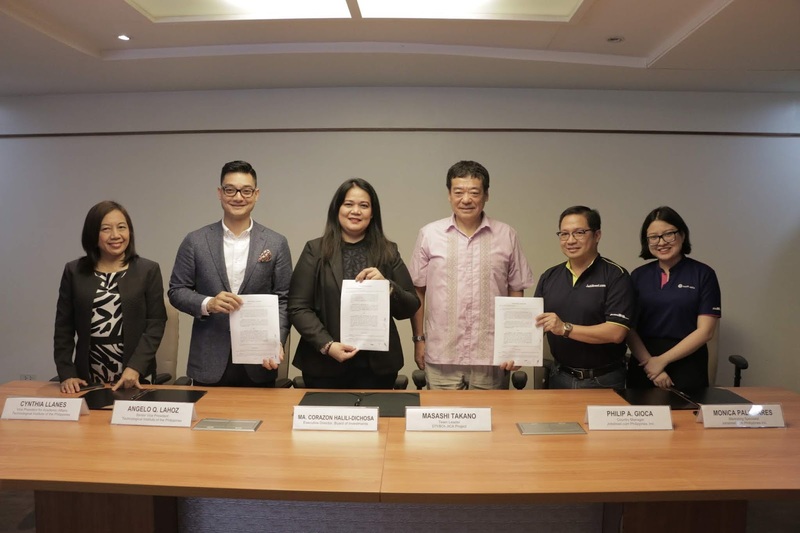 Representatives from each partner organization sign a memorandum of agreement recently at the Department of Trade and Industry Head Office in Makati. The automotive industry in the Philippines is experiencing a dramatic boom. 10 years ago, 100,000 cars were produced over the course of a year. Now, 400,000 are being manufactured annually. With projections showing that car sales will achieve 1 million between 2025 and 2028, companies across the entire automotive supply chain are stepping up their efforts to recruit more employees in response to increased demand. One concern faced by the industry has to do with the human resources involved – there is a weak linkage between universities, whose fresh graduates will represent a large part of the new workforce, and the manufacturing and assembly segments of the automotive industry. Both students and university staff demonstrate limited knowledge of the companies and processes involved in automotive production, while most OJT programs for students are typically found in the servicing sector, far removed from assembly and manufacturing.